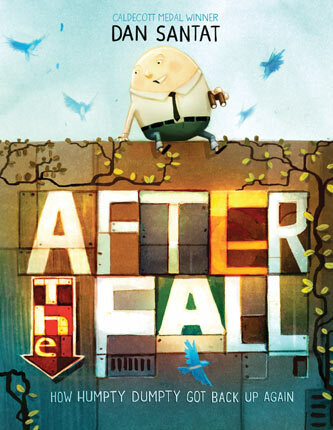 School Library Journal - 09/01/2017 PreS-Gr 2—Humpty Dumpty, a spindly-limbed pale egg, copes with anxiety after his "Great Fall." Though his shell has mostly healed, a newfound fear of heights prevents him from enjoying his birdwatching, and even from choosing the delicious cereal on the top shelf at the store. But he still yearns for the skies, and Santat employs a variety of striking perspectives to help readers appreciate the enormity of Humpty's isolation and distance from his goal. Determined not to give up his favorite hobby, Humpty builds a model plane—Santat milks the humor of the frustrated, fastidious egg during a design sequence—that soars across the sky. When another, lesser accident occurs, Humpty must conquer his nerves or give up on flying. Santat's straightforward language throughout acknowledges the gravity of Humpty's fears without edging into melodrama; the short, declarative sentences that mark his anxious climb back onto the wall are rousing in their simplicity. (The backlit egg's triumphant posture doubles down on the text.) Many readers might have considered the ascent an adequate end, but Santat indulges in one more high note when the reformed shell cracks anew and releases an exultant bird. VERDICT Santat's precise illustrations and sensitive text combine for more emotional depth than the typical nursery rhyme remix. A terrific redemptive read-aloud for storytime and classroom sharing.—Robbin E. Friedman, Chappaqua Library, NY - Copyright 2017 Publishers Weekly, Library Journal and/or School Library Journal used with permission. 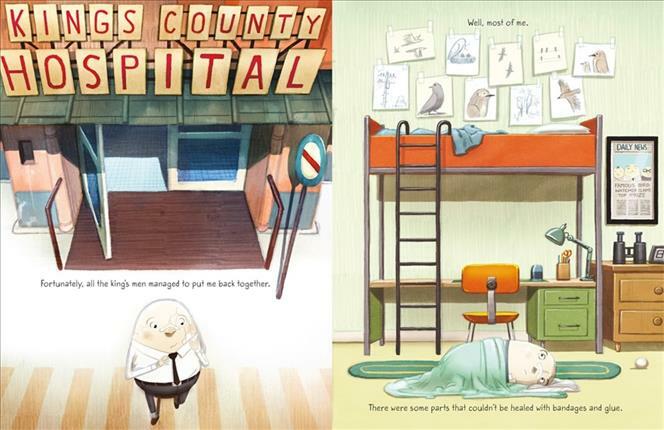 Booklist - 09/15/2017 *Starred Review* Thanks to modern medicine, Humpty does get put back together again. But he’s a shell of his former self: the trauma leaves him afraid of heights, and so, unable to watch the birds from his old vantage. Searching for a rewarding alternative, he crafts a wonderful flying bird from paper that immediately gets stuck atop the very wall from which he fell. What to do? Santat depicts his rotund narrator with mobile, expressive features, and places him in a sparely detailed urban setting. Lighting and visual cues (including a truly heartbreaking view of grocery shelves on which the bright, enticing cereal packages are on high shelves and only drab brands like “Flax” and “Sad Clown” are in reach) communicate the depressed Dumpty’s emotional landscape effectively. Ultimately, Humpty screws his courage to the sticking place and scales the wall. No sooner does he realize that his fear is gone than he starts to crack—and, with an apotheosis that soars literally as well as figuratively, reminds us what eggs are for. The author gives wings to both his protagonist and his message about the importance of getting back up after a fall, and the realization that recovering from a trauma takes time. - Copyright 2017 Booklist.